"What do we do when we discover that the religious beliefs we have placed our trust in are not adequate to address the violence and the evil that confront us? What if we discover that our theology hinders rather than helps." And the joke that preachers have played on the world is to create a myth that God redeems the world by killing his own son. The huge mistake religion has made in the world is to teach that violence is redemptive, that punishment restores relationship, that vengeance is the path to peace. Upon reflection, it becomes very apparent that the myth of redemptive violence is false. Jesus, himself, did not preach this and in fact preached the opposite that we are to love our enemies and do good to those who would harm us. How the theologians and doctors of the church perverted Jesus' teachings into the idea that God needed Jesus to die for our sins to atone for the wickedness of the human heart is the ultimate irony and misunderstanding of what Jesus taught. And so in the darkest of hours, like when my two children were killed by a drunk driver, I was expected to hate, to want vengeance on him who killed them, and I did not feel this in my heart and felt that there was something wrong with me, that I did not love my children enough to want him dead, but I didn't and don't and people don't understand this. I get Jesus. I understand what He said. I went to visit my children's drunken killer in jail and I asked him to join AA. I asked him to look at his life and repair what isn't working for him and for me and our family and our community. He agreed. Who can ask for anything more? And so we need a new theology of restoration of right relationship when we run afoul. It requires listening, reflection, understanding, taking responsibility, and the making of amends. It is not hard really, just a different and better way. Unitarian Universalists believe in the inherent worth and dignity of every person and the implementation of justice, equity, and compassion in human relations. Unitarian Universalist believe in the interdependent web of all existence of which we a part. Evil requires identification, acknowledgement, accountability, and the making of amends. As Gandhi said, "An eye for an eye makes us both blind." To answer Rebecca Ann Parker's question of what do we do when our theology fails us, it is simple really, we change it to something better. More than just changing our theology we have to live it, and often we do it stumbling, awkwardly, trying to find our way, listening to the small voice within which whispers to us what is right even when the world around us tells us we are wrong and claim that they know what God would have us do. Thanks to Boston Unitarian and Moe for your comments. They mean a lot to me and give me hope that there are at least three people in the world who are looking for a better way. Powerful words Dave. We grow up believing that Jesus died for our sins in Christianity. As you say ... it doesn't make sense. Thanks Dave. Your words make sense. 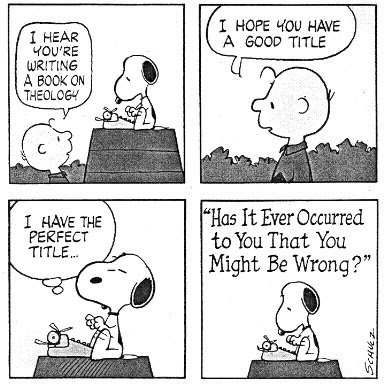 I love this peanuts cartoon. It should be on the first page of every book on theology.